Yoda: Hmmmm... new Jedis should be here by now. Late they are... very late. (An X-Wing has crashed into a swamp and smoke is rising... then suddenly, Yakko, Wakko, and Dot come out in Star Wars costumes [Yakko - Luke white robe thingy, Wakko - Han Solo, Dot - Princess Leia]. Dot: Way to go, Wakko. Wakko: Me?! You tried to dress him up! Dot: (screaming) You tried to eat him!! Yoda: Jedis you are, yes? Yakko: You really should do something about that skin condition of yours. Dot: And that outfit! Peee-yew! Wakko: (Presents a mirror.) What do you think? Yoda: (Admires the new look.) Hmm. Say, that's not too. . .Wait a minute! (Rips off makeup and starts screaming.) Much Jedi training to do! Foolishness stop it must! Yakko: Sounds like you need some grammar training. Dot: (holding textbook) There are two parts to every sentence. The first part is the subject. The second part is Subject II: Revenge of the Subject. Yakko: Well, at least he knows about interjections. Yoda: Stop it! Stop it! Stop it! Much training to do! Training, training, training, training! Yakko: Someone stop this man from yelling, "Training." 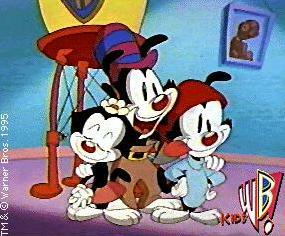 Yakko, Wakko, and Dot: (wave to animator) Thank you. Yoda: Tired I am, and hungry. Eat first we will, and then continue training. Wakko: I'm starved! What do you have to eat? Yoda: Porridge. Plain and simple food Jedis eat. Build character it does. Yakko: Ahhhh, looks like we'll have to get something else. Any votes? Dot: Something fancy, by romantic candlelight! Stewart: Tea, earl gray, hot. Wakko: What do we eat? (Pauses. Suddenly, an idea hits him.) I know! Yakko, Wakko, and Dot: Pizza! Wakko: Yes, I'd like a dozen extra large pizzas sent to Yoda's hut on the swamp planet, Dagobah. (pauses, listening to phone) Give 'em the works! (pauses) Just a minute. (bends over to achieve eye contact with Yoda) Do you have a credit card? (Yoda fishes through his pocket and hands it to him) Thanks! (resumes talking into the phone) All right, 5378 89. . .
Yoda: Obi-Wan Kenobi, old friend! Come to help me you do. Sound advice I require. (cups hand beside mouth to keep Warners from hearing, and speaks quietly) How do I get rid of these kids? Obi-Wan: Yoda, it is difficult for new Jedis to learn. Remember when you were training me. I did not respond well at first, either. Yoda: Yes, remember do I. (looks annoyed) Tied my shoelaces together, you did, and laxative you put in my porridge. Obi-Wan: Besides, I've enjoyed watching this. I haven't laughed so hard in millenia! Continue the training Yoda, I implore you, for the future of the rebellion. Yakko, Wakko, and Dot: (Dancing in circles around Yoda) Yes, please? Continue the training. Please, please, please? Yoda: (sighs) Very well. On with the training! Yoda: The Force is everywhere. From this tree, to that rock. From the sky to the ground. . .
Yakko, Wakko, and Dot: (singing) From sea to shining sea! Yoda: Enough! May The Force be with you. Practice saying that you must. Very important. Yakko, start you will. Yakko: (standing by a very old-looking horse, flies buzzing around) May the horse be with you! Wakko: (standing by some guy) May Dash Morse be with you! Wakko: (to Dash) Let me introduce you to my sister. (He ushers Dash over to Dot, and they shake hands.) Dot, Dash. Dash, Dot. Dot: (disgusted) Oh. I get it. It's a Morse Code gag. Ha, ha. Very funny. Yoda: No, no, no! Foolishness stop now it must! Prepared you must be for the confrontation with. . .(gasps, seeing something off-camera) DARTH WAITER! Darth Waiter: May I take your order, please? Hahahahahahahaha! Yakko: (to Yoda) Who is that? Yoda: Dark side of The Force, he is. My student he used to be, until he turned to the forces of evil. (looks annoyed) Had a part time job at a local restaurant, he did, and gave me escargots when I ordered ribeye. Knows I can't digest the stuff, he does. Darth: (draws light-saber) Prepare to meet your doom, Jedis! Darth: Before you send me to my demise, I want you to know. . .I'm, um, I'm, yeah! I'm your father! That's it! Yakko: Ahhhhh, I don't think so. Wakko: That's what I heard. Yakko: There's only one way to find out. Yakko, Wakko, and Dot: Ed Asner! Yoda: Completed your quest you have. Finished is your training. Now, into your spaceship you must get, and fly out of here as fast as possible! Yakko: Oh, no! We've just started! Dot: We just got our schedules back for next semester. We've signed up for Advanced Jedi Training 102!